In human interaction, there’s something called personal space. It’s that comfortable distance between you and the stranger next to you. It quickly becomes uncomfortable when that other person gets a little too close. The same is true with pistons and valves. It can get downright violent when valves get a little too close to the pistons. In this new golden age of horsepower, the packaging of higher compression ratios, tighter quench spaces, bigger valves, and more aggressive camshafts now make checking piston-to-valve (P-V) clearance an even more crucial step when building any performance engine. It’s no longer acceptable to slap an engine together with a big cam and a taller rocker ratio and assume that all the parts will always play nicely together. This piston-to-valve clearance was adequate at 6,000 rpm but at 7,000 rpm, a loss of valve control caused this exhaust valve to contact the piston and bend the valve. There are several techniques that can be used to measure P-V clearance, but the two most popular are the clay method and the “valve drop” technique. We will run through both examples in this article. The clay method is easiest to use when the engine is being assembled or if the heads are off the engine. Before running through these procedures, it’s important to note that the camshaft should be degreed before checking P-V clearance. This isn’t essential, but it’s always best to know that the camshaft is installed correctly. Piston to valve clearance is directly affected by cam position. Stated another way, changing the cam position directly affects P-V clearance. Since you will need a degree wheel and dial indicator in place to perform the valve drop method, it just makes sense to go that extra step and degree the cam. It’s critical to first degree the cam before doing any piston-to-valve measurements since it’s helpful to at least know the cam’s intake centerline position. 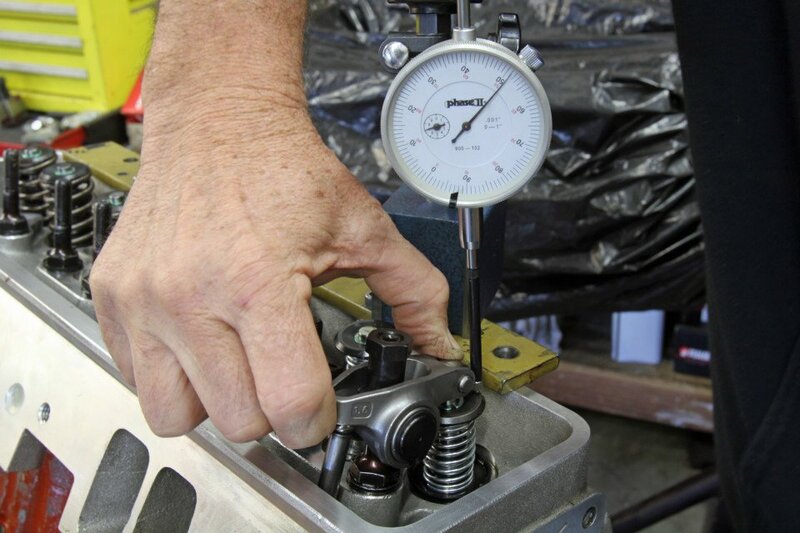 Advancing or retarding the cam timing can modify your piston-to-valve clearance, so having a solid baseline is a must. To perform the clay method of checking P-V begins, you have to start with the cylinder head removed. Place a quarter to half-inch layer of modeling clay in the valve reliefs of the piston. Lay a thin coating of oil on the valve faces to prevent the clay from sticking to the valves during the test. Next, install the head with the gasket that will be used in the final assembly. You will tighten several head bolts around the cylinder but it’s not necessary to install and torque all the cylinder head fasteners. Follow this by installing the lifters, pushrods, and rocker arms on both valves for that cylinder. If the cam is a hydraulic design, it’s best to substitute a solid lifter for this test since the hydraulic plunger can depress during the test, reducing the amount of valve lift, which will lead to incorrect results. If a solid lifter is not available, you can create a test lifter using an old hydraulic lifter. When degreeing the engine or checking piston-to-valve clearance on an engine with a hydraulic cam, its best to convert an old hydraulic lifter to a solid by adding washers to replace the internal piston. Always use a flat tappet lifter on a flat tappet cam and a roller lifter on roller cams when checking P-V or degreeing the cam. To make the test lifter, remove the clip and internal piston from a hydraulic lifter, and replace the piston with a stack of small washers to position lifter cup in its stock location. Do this for both the intake and exhaust lifters and set the valvetrain at zero lash. If the engine uses a mechanical cam, include a cold lash clearance. With the valvetrain in place, rotate the crank through at least four full rotations to ensure the valves have made an impression in the clay. After removing the valvetrain and head, there should be an impression from the intake and exhaust valves in the clay. Carefully slice the clay with a razor blade to expose the thickness of the clay where the valves made contact. That thickness will reveal the actual P-V clearance. Place a couple of small lengths of clay roughly 1/4- to 3/8-inch thick in both valve relief areas of the piston (left). It’s best to remove any carbon or oil from the piston top to allow the clay to adhere to the piston during the test. After rolling through a valve lift curve on this big-block, we cut the intake valve clay depression to measure the remaining clearance (right). This distance measured very close to 0.175-inch. Also note the radial clearance between the outer diameter of the valve and the piston relief of around 0.080-inch. The valve drop method is slightly more involved and requires a degree wheel, pointer, accurate TDC location, light-duty checking springs, a magnetic base, and a dial indicator. Set up the checking fixtures on Number One piston with the head gasket and cylinder head you will be using. Assemble both the intake and exhaust valves with a checking spring and include a cold lash setting if using a mechanical cam. The checking springs will make the test easier to execute. First, position the dial indicator on the exhaust valve spring retainer and make sure the dial indicator can accommodate the entire valve travel distance. Next, rotate the engine until the degree wheel indicates 10 degrees Before Top Dead Center (BTDC). This 10 degree-BTDC position is usually very close to the tightest point between the piston and exhaust valve. We will check piston-to-valve clearance using the valve drop method on this small-block Chevy. Place the number one piston at 10-degrees Before Top Dead Center (BTDC). Mount a dial indicator to indicate off the exhaust retainer and zero it at 10 BTDC. Push on the rocker arm until the valve gently contacts the piston and read the amount of dial indicator travel. In this case, the dial indicator moved counter-clockwise, recording a total of 0.149-inch of clearance. Zero the dial indicator and push on the valve side of the rocker to open the exhaust valve until it contacts the piston. The additional amount of travel on the dial indicator is the amount of exhaust P-V clearance. If you want to make sure that this is the tightest point, move the crank a couple of degrees on either side of 10 degrees BTDC and note the clearance and evaluate the numbers. With the exhaust valve clearance recorded, now move the dial indicator to the intake valve retainer and rotate the engine to 10 degrees After TDC (ATDC). With the dial indicator again set at zero, run through the same procedure of depressing the valve and reading the clearance. With both intake and exhaust clearances recorded, you can compare them to our supplied chart. For most street engines, the clearances will probably be much wider than the minimum which means no further work is necessary. Checking Springs - How Accurate Are They, Really? Race engine builders will argue that using checking springs for this process isn’t entirely accurate, and they are correct. Using the actual valve springs creates a small amount of deflection in the valvetrain that will reduce the lift at the checking point. While this is correct, the process is much more difficult because you will have to build a custom tool to deflect the spring against spring pressure. By using the checking springs, this is the tightest the P-V could achieve. We checked the amount of deflection at maximum lift on one of our small-blocks and discovered a loss of 0.030-inch at maximum lift. This is no small amount but at the closest P-V point, the deflection will be a smaller number – perhaps only 0.010-inch. We’ve included a generic P-V clearance spec chart for street engines that is generally accepted as safe, but does not necessarily represent the true minimums. If there is any question about valvetrain instability, then more clearance is better. For competition engines, the clearances can be tightened, but only if the engine builder is aware that these numbers are much closer to allowing contact. The race engine builder constantly works at creating a balance between sufficient P-V clearance while not sacrificing compression by removing any more material than necessary from the valve reliefs. All These Numbers – Now What? If testing reveals the P-V clearance is too tight, there are some adjustments you can attempt. For example, let’s say the exhaust valve clearance is tighter than you are comfortable with but the engine is already assembled and you don’t want to fly cut the pistons or change the cam. The first thing to try would be to advance the camshaft by a couple of degrees. Advancing the cam will increase exhaust P-V clearance. This may only be worth only a few thousandths of an inch, but this may be enough to keep the valves away from the pistons. Conversely, if the intake valve P-V is tight, you can retard the cam a couple degrees. Keep in mind that moving the cam affects both valves. So if both P-V clearances are tight, moving the cam will help one but reduce clearance on the other. To check the intake piston-to-valve clearance, we moved the piston to 10-degrees ATDC using the same procedure. Again, the dial moves counterclockwise so we had to count back from zero, so the clearance equals 0.137-inch, which is more than sufficient. Note we’re using 1.6:1 rockers. If the P-V clearance had been too tight, we could reduce the rocker ratio to 1.5:1 to increase clearance slightly. At max lift, a 0.10 rocker ratio change is worth around 0.030-inch of additional valve opening. If both P-V clearances are tight, another option is to increase head gasket thickness. Obviously, this reduces compression, so this is usually not a good idea unless the piston-to-head clearance is dangerously too tight. Ultimately, the best solution for tight clearances is either to cut slightly deeper valve reliefs in the pistons or change the cam timing. This is why mocking up the engine ahead of time to check this clearance is the best procedure. This also underscores why custom engine building is both time-consuming and expensive. 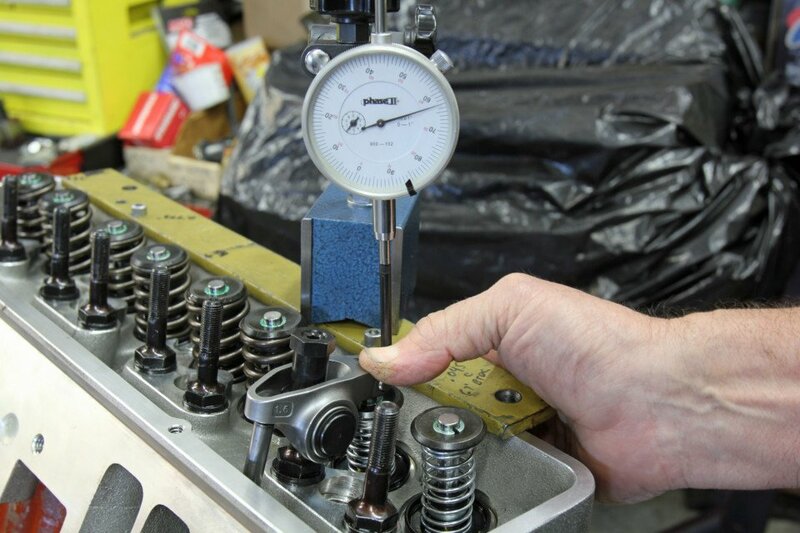 There are additional but more complex checking procedures such as establishing the radial clearance between the valves and the piston and ensuring the piston valve relief angles match the valve angles in the cylinder head. 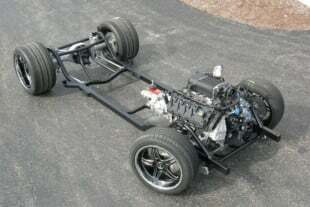 These are more custom race engine situations that the typical street engine builder is not likely to face. The valve angle becomes an issue if you decide to change cylinder heads where the valve angles have changed. 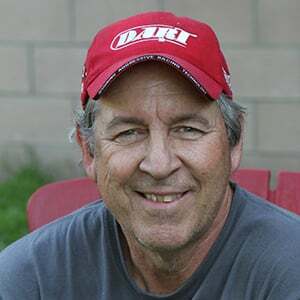 For example, changing from a 23-degree to 18-degree small-block Chevy head will demand a different piston because of the radical change in valve angle.